When you consider creating a new part that is to be made of plastic and the tooling cost is considerable, it is most desirable to test the functionality of the part prior to actually building the tool. Modifications to a tool can not only be costly but degrade its overall performance and longevity. The CAD Systems of today, such as Solid Works, which is what we use at SPI Blow Molding and SPI Injection Molding, provide a great deal of power to make changes to a part quickly as well as draw all related interacting parts to test the stack up interference fit required in a final assembly. Solid Modeling on the computer has replaced the need for some part prototyping of the past. Nonetheless, there are several current approaches to making a prototype of a product that remain relevant today. SPI offers modeling, rapid prototyping, pull ahead cavities. Originally a professionally fabricated model made by a professional model builder was the only type of prototype available. The prototype could be constructed of wood, plastic or metal depending on the size and function of the performance test needed to prove its size and function. A fully functioning prototype model is still relevant today with many manufactured parts. Building in time and the cost to create a model to get the exact data to avoid or at least reduce the iterations of design changes is well worth it. Utilizing SLA/SLS technologies to assist customers’ part visualization needs. Rapid prototype molds from cast to more traditional machined surfaces of aluminum or steel. Modern technology, such as Plastic Part Printing, or 3-D printing, has decreased prototyping time and expense. 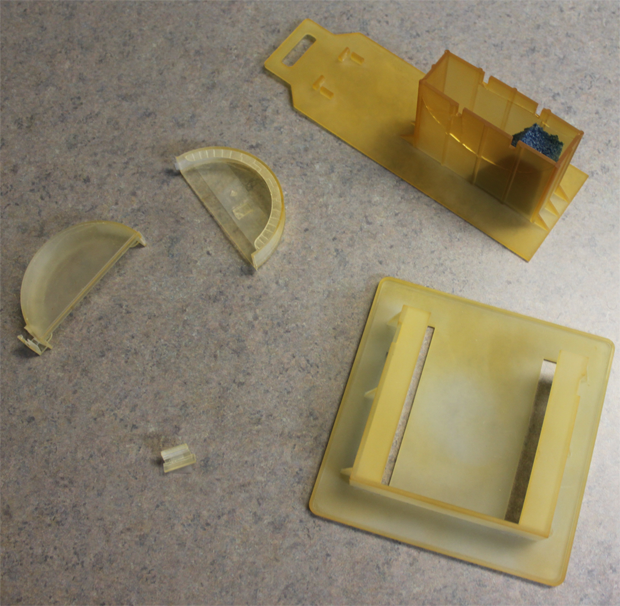 Rapid plastic prototyping is most best used to determine size and fit, not strength and toughness. Material characteristics will be very different in the prototype than in the final molded version. The part can be hollow or in nearly any shape, making it a perfect process to prototype parts for both Injection Molding and Blow Molding, which is what we do here at SPI. Another approach to prototyping is the concept of pulling forward a cavity in a multiple cavity tool. If the project is for medium to small plastic parts, then it is very common to use a tool in production containing several cavities of the same part. In this case it is sometimes wise to build one cavity and use that cavity to produce prototype parts. If changes are required, modifications can be made to that cavity only, allowing all subsequent cavities to be constructed to the newly proven geometry; resulting from the testing on the prototype (pull ahead) cavity. This is also the prototyping choice where many parts are required for testing and the test challenges the strength and toughness characteristics. Call us today when you start planning on making a prototype of a product to discuss the best options and materials for this important initial stage prior to production.